Welcome to Baan Yin Dee Boutique Resort, a small luxury hotel nestled on a peaceful hillside at the southern tip of Patong Beach. 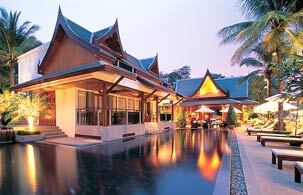 Baan Yin Dee has 21 elegant, spacious rooms and suites arranged around the four swimming pools. Each room or suite features extensive amenities and including large Mini-Bar selection, cable television and DVD players. The restaurant at Baan Yin Dee overlooks Patong Bay and is well established as a renowned dining venue. Here you will find a warm, relaxed, stylish atmosphere with a discreet ambience and outstanding service offering a fusion of European and Thai food to please the most discerning palate. The carefully designed menu, nightly pianist and comprehensive wine list unite to ensure an unforgettable dining experience. Complimentary round trip shuttle via Mercedes Benz from any location in Patong is available to all dinner guests.